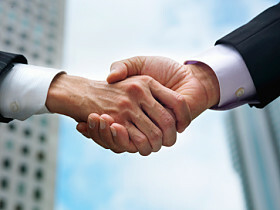 The impression you make on people through your handshake influences how they feel about you. A proper handshake is even more important when meeting people for the first time. First impressions are lasting impressions. The manner in which you extend your hand, the degree of firmness and the timing demonstrate your poise and confidence and will inevitably set the tone for your relationship. In this lesson we will explore the specifics of handshake etiquette and examine how a handshake can enhance your brand. If you are a male and you meet a female, who should extend their hand first? If you are a male and you are meeting another male, who should extend his hand first? If you are a female and you are meeting a male, who should extend their hand first? If you are a female and you are meeting another female, who should extend her hand first? If you are a male and you are meeting a female, you should wait for her to extend her hand first. If she does not initiate a handshake, do not be offended. If you are a male and you are meeting another male, you should always extend your hand first. This is a sign of confidence and self-assurance. If you are a female and you are meeting a male, you should extend your hand first. Even though women are a significant part of the business world, men are still confused about proper behavior. Be mindful and extend your hand. This will put the man at ease and is also sign of your confidence and self-assurance. If you are a female and you are meeting another female, my successful female friends tell me they always extend their hand first in a business setting. When should you shake someone’s hand? Every time I greet a male I shake his hand. Every time I meet a female who extends her hand to me, I shake it. This simple rule applies if it’s a Super Bowl party or a business meeting. How firmly should you squeeze someone’s hand? Well, you don’t want to feel like a limp noodle nor do you want to crack their knuckles. The best description I can offer you is “comfortably firm.” This is true for both men and women. In business, I have never heard of an occasion where either a male or female would consider a soft, wimpy handshake acceptable. How would you describe your handshake? Firm? Aggressive? Wimpy? If you don’t know, shake the hand of a good friend and ask for feedback. As you shake people’s hands make sure you grip their entire hand and not just their fingers because you closed your hand prematurely. I hate it when that happens! When should you let go of your grip? The answer: You should let go, when they let go. I often encounter people who want to hold my hand for an extra few seconds as they greet me. So as long as they want to hold my hand, I hold theirs. Furthermore, you don’t want to hurry out of the handshake, as this will be an indication that you are not genuine in your greeting but rather just using the motion as a formality. One last question. Let’s see how you do on this one. If you extend your hand to people and they do not extend their hand in return, what should you do? Should you retract your hand or hold your hand there until they accept it? The answer: hold it there until they grasp your hand. Removing your hand conveys a lack of confidence. Here’s my challenge to you. Beginning with the next person you meet, focus on making a positive impression of yourself through your handshake. It may be a little uncomfortable or awkward at first, but like every lesson you are learning, the more you practice it, the better you will do. If you will focus on doing the little things to make a positive impression on others, your value to the market will grow and your life will become more enjoyable and fulfilling.